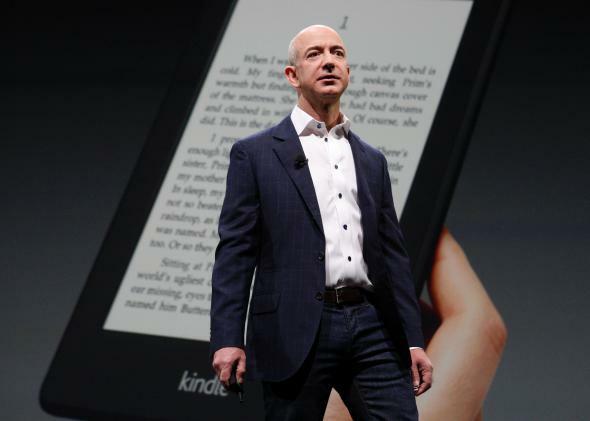 Amazon Kindle Unlimited: A Netflix for books from Jeff Bezos. Jeff Bezos, the mastermind of Amazon and Kindle. Starting today, you can sign up for Amazon’s Kindle Unlimited, a new service that grants access to 600,000 e-books and several thousand audiobooks for $9.99 a month. Contrary to what you might think, the subscription isn’t stuffed with self-published titles at the expense of acclaimed books. All the King’s Men, The Hunger Games, The Handmaid’s Tale, Life of Pi, and the Harry Potter and Lord of the Rings series are just a handful of the more popular and well-known titles that are currently available. Amazon does not publicize the number of e-books available through its online store, making it difficult to know exactly what fraction of the company’s electronic shelves Kindle Unlimited will open up to subscribers. In 2010, Amazon said in a press release that its U.S. Kindle Store had more than 630,000 books for sale. The following year, the New York Times reported that Amazon’s wares had grown to 950,000 Kindle books. So it seems reasonable to assume at least that the company’s stock of e-books long ago surpassed 1 million. Perhaps most interesting about Amazon’s Kindle Unlimited announcement is its timing. As everyone now knows, Jeff Bezos and his company are embroiled in a feud with publishing house Hachette over the terms of its contract for physical and electronic book sales. The unusually public dispute has included Amazon delaying shipments and removing preorders of Hachette titles. There has also been plenty of mudslinging from both sides, with Amazon most recently attempting to go around the publisher entirely by making a direct offer to authors and agents. Kindle Unlimited will add a new layer of complexity to negotiations between Amazon and publishers. So far, it seems that most of the big-name publishers haven’t agreed to let their titles onto the subscription platform. Books published by HarperCollins and Simon & Schuster aren’t offered and those from Penguin Random House are notably absent. Amazon has not said how authors and publishers will be paid for participating in Kindle Unlimited, but it’s unlikely that the models currently used for e-book sales through its store will do the trick. From a customer’s perspective, is Kindle Unlimited a great deal? Pricewise, it’s more or less on par with similar services such as Oyster ($9.95 a month for access to more than 500,000 titles) and Scribd ($8.99 a month for access to more than 400,000 titles). In fact as Gizmodo astutely points out, the biggest competition for Kindle Unlimited right now might be Amazon itself. Current members of Amazon Prime can check out one book a month from the Kindle Owner’s Lending Library (selection: more than 500,000). Prime, of course, also includes free two-day shipping, streaming movies and TV shows, and streaming music. At $9.99 a month, or about $120 a year, Kindle Unlimited is $20 more expensive than Amazon Prime. And while it might have a slightly bigger selection of books, it comes with a lot fewer other perks.